If you have a lot of content to promote, you can partially automatize your effort by utilizing rotation of the marketing campaigns. This feature works especially well if you fetch your content from external sources. 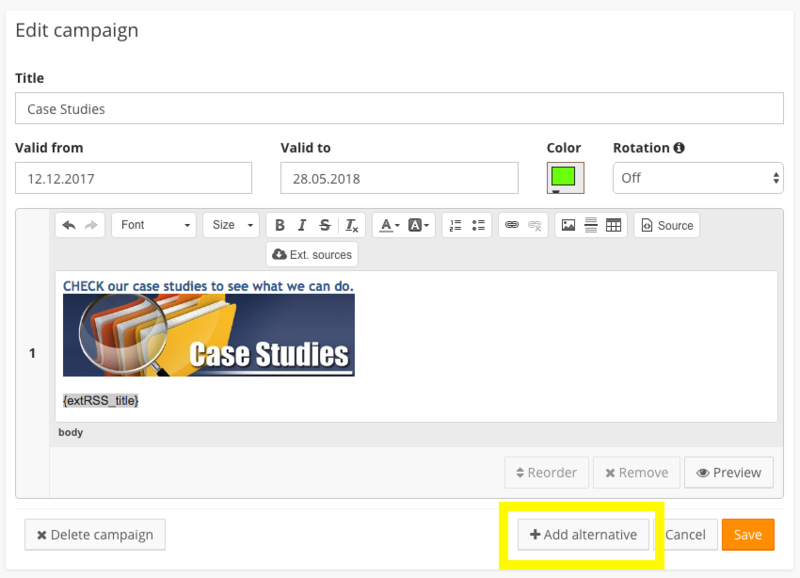 You can set several alternatives of your campaign by clicking on Add alternatives button in the campaign details. This alternative campaign can alternate your current campaign, so you can have different text in your campaign for instance. You can set the type of rotation by clicking on the section Rotation next to the color of the campaign. Random rotation - Alternative campaigns will change on a random basis - even the individual users will have different alternatives applied. Regular rotation - Alternative campaigns will periodically change in the set sequence. Off - Only the first version will be applied. This is also the default option. By clicking on button Reorder, you can choose the order of the alternative campaigns with simple drag and drop function. You can add up to seven alternatives to your campaign. These campaigns work best with the subscription mode, which allows you to update signatures on daily basis.